Hello, my name is Nicole Carr, and this is my family. Feel free to browse around, meet my ancestors, view my sources, and see who else has stopped by to visit. Browse through my family tree on the WorldConnect Database. 2000+ individuals with about 500 different surnames. Sign my guestbook, or just see who else might be researching your surname. Thumb through my photo album. More pics are added regularly. View a list of my sources, with links to those available on-line. Find out what's new to the site. Genealogy is always a work in progress. View headstones from Gibbon, Hastings, Marquette, Shelton and Wood River, Nebraska, Magnolia, Iowa, and Wheatridge, Colorado. Read some obituaries. Most are pre-1926, but also includes links to off-site obits and those I have yet to post online Check out the Sober Book, a genealogy of the Sobers tracing back to Isaac, born about 1740 in New Jersey. Find out about me, my family, and where we come from. A chuckle or two guaranteed. Read a letter from Stella Sober to her cousin, Lou, about the family's history and the legend of the origin of the Sober surname. Also, see all the surnames in my database on my surname page. Updated regularly. 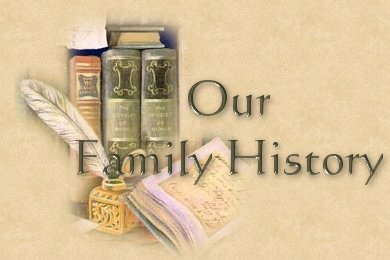 Follow links to other good genealogy sites that I have come across in my research. Read a transcription of the last will and testament of Stephen Mahoney Another letter from my great-great grand- mother Hattie McKnight to her future husband, Frank Reed. Not an ordinary love letter! Catch up on what was happening Nov. 2, 1911 in Shelton by reading snippets from The Clipper. The page is off-site. Find some helpful resources to aid your research. How-to's, translations, etc. Surf through other genealogy sites in various webrings to which I belong. Visit pages for surname mailing lists and message boards I administer, with info on how to join or post messages. me with any comments, additions or corrections. Irene, Diane, Dorothy, Maxine, My mom (of course), Gary and Janice, Joyce, Susie, My Grandmother, Darlene, Martin, Candy, Linda L., my sister Jill, Ruth, Tom, Carol, Laurie, Linda B., Gladys, Cheryl, Vicky, Mona, Janet, Rene, Rob, Audrey, Donna, Lynn, Hope, Jean, and all I've forgotten. THANKS! who provided the email graphic you see on EVERY PAGE along with the genealogy sign on this one. Please give her site a visit, as well. in which their art appears, with a link to their site. They are all worthy of a visit. All submissions to this website remain property of submitter. (That includes me). Keep in mind that these are just pieces of a whole genealogy puzzle, and are to be used as a guide rather than a definitive source. PLEASE let me know if you find any information on this site, or in my family tree database in error. Like most research, I am constantly finding new people, information, and sources to share, so keep coming back. Thanks!